Christmas music can affect you in many ways. You have the quiet reflective aspect, the melancholy dreaming aspect, the romantic aspect, the childhood aspect, and you have the goofy fun aspect. Beyond just the songs, though, the fun aspect can be made even more fun and silly. 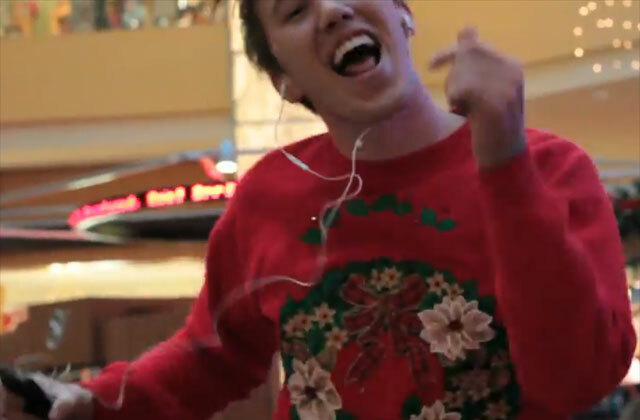 Here are a few videos of people enjoying themselves way too much with Christmas music. First up is my favorite new Christmas video this year. Preston Leatherman is an Oklahoma born, currently Nashville living musician with a ton a charisma and not and ounce of shame. He has done a tom of videos that you can find on his PRESTON LEATHERMAN WEBSITE. One thing he has tried are a couple of videos called DANCING WITH AN IPOD. The latest is his enthusiastic dance to Mariah Carey’s ALL I WANT FOR CHRISTMAS IS YOU. The concept is that he goes to a busy mall, puts on his headphones and begins his dance to the song. The conceit is that only he hears the music because he is playing it through the headphones of his iPod. Of course, there may be no better Christmas dancing than the gang from A CHARLIE BROWN CHRISTMAS. The City of Detroit has it’s own unique Dancing Santa. I’ve posted this before, but I love it. 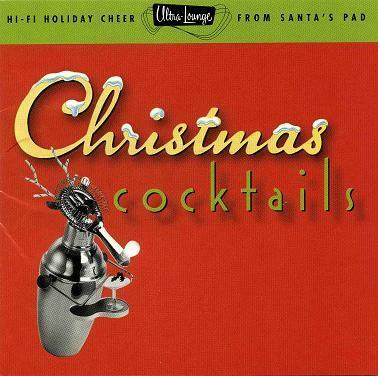 RUDOLPH THE RED-NOSED REINDEER by Billy May And His Orchestra. 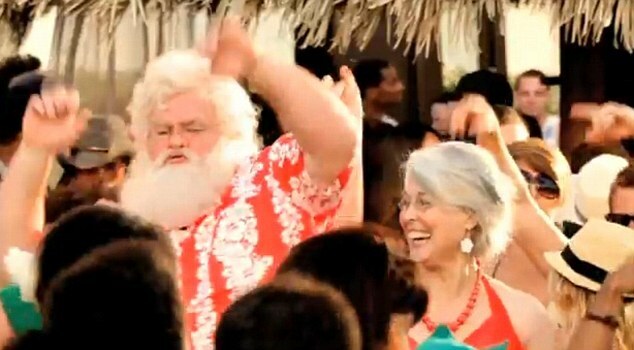 Pepsi-Cola decided that when Santa wants to dance while on his own holiday, he wants to dance and doesn’t want Coca-Cola. A few years ago, OFFICE MAX had a character based on THE SPINNERS song RUBBERBAND MAN. For Christmas, they did a special version. 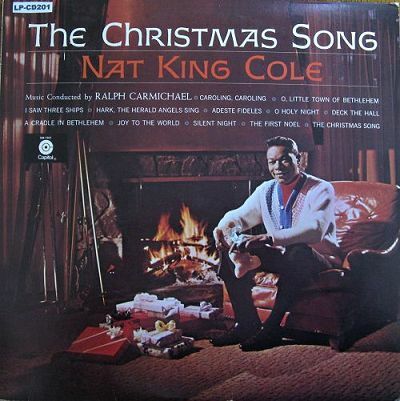 And to wrap up, a quick look at what may be the most misguided Christmas TV Special ever. 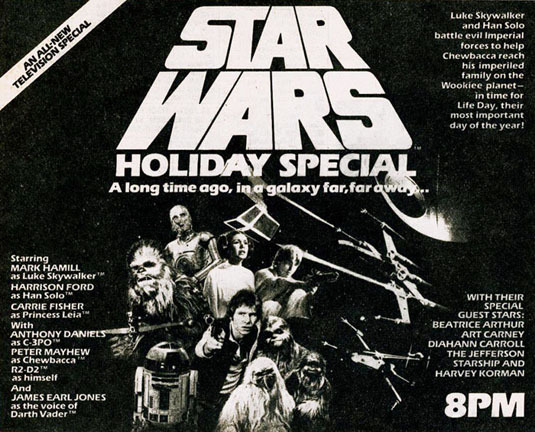 THE STAR WARS HOLIDAY SPECIAL. Christmas has always involved the commercial, and let’s face it, the exchange of gifts has grown into a sales time that can make or brake the profit picture for a store. Television has of course merrily joined the party and at Christmas, you are bombarded with holiday ads that want to sell you lots of potential gifts with as garish or ridiculous a premise as possible (Raise your hand if someone is getting you a Lexus this year). But despite an onslaught of overcaffinated shoppers like TARGET’S truly terrifying Christmas Champ Lady (who didn’t even bother to celebrate Thanksgiving) to shoppers at Best Buy quite happy to piss Santa off over their shopping accumen. This may be the most beloved Interstitial that a network ever did. 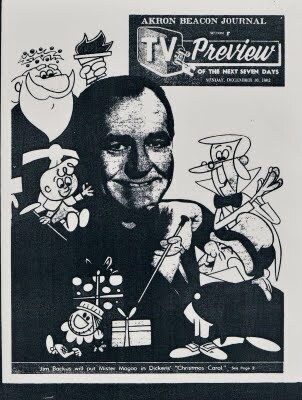 During the 60’s, CBS-TV used this very simple pen and ink animation to capture the sound of Christmas. Local stations used to do their best, as well, with spots and promotions aimed at their own audience. 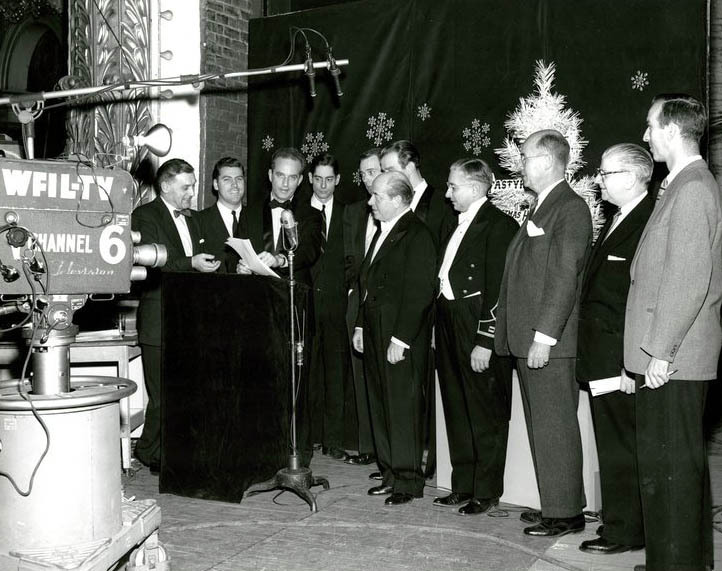 One early example was a holiday special with Eugene Ormandy and the Philadelphia Orchestra perform a Christmas Concert from the Academy Of Music in 1955, sponsored by the Tasty Baking Co. (Tastykake). It was called THE TASTYKAKE CHRISTMAS HOUR. 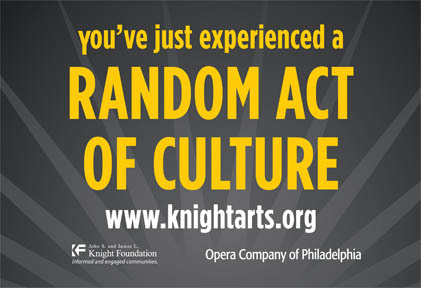 The University Of Pennsylvania has a webpage for it. 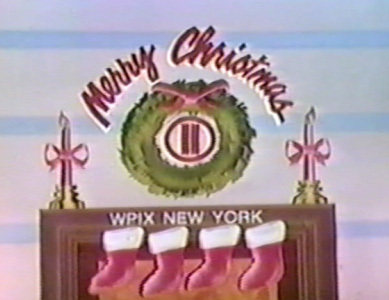 The simplest and most lasting memory may have been the variations on the WPIX-TV NYC Yule Log. This was broadcast Christmas morning for a few hours and consisted of a loop of a burning Yule Log coupled with Christmas music. Perfect to unwrap the presents and then fall back to sleep for a little while. 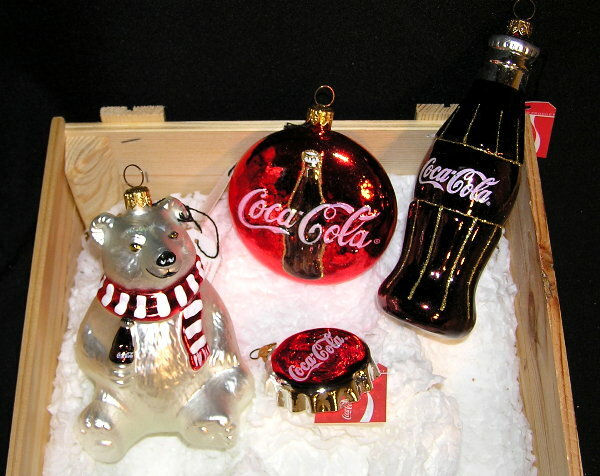 Some of the best remembered Christmas ads are for products that are not normally associated with gift giving. Snacks and beverages have long been the leader in timeless Holiday spirit. Here are just a few ads from across the years. Back soon with more Christmas blog merriment. 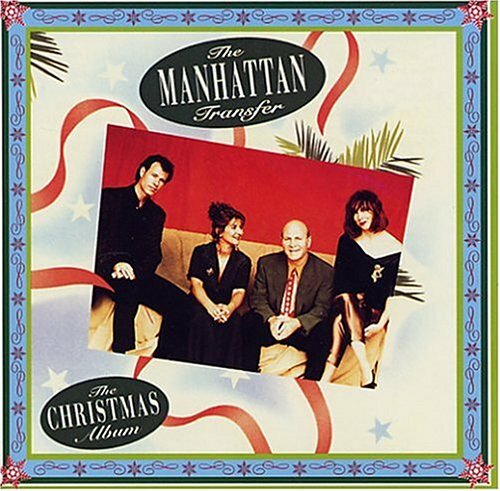 First up, a little HAPPY HOLIDAYS with a Manhattan Transfer Swing. 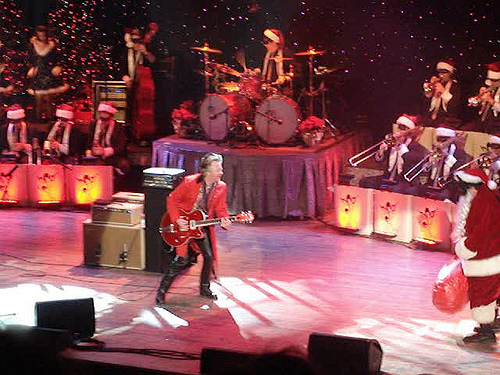 BTW, for those from the Philly area, MT member Tim Hauser is a Villanova Grad..
Next up, some more retro swing with Brian Setzer: ‘ZAT YOU SANTA CLAUS? 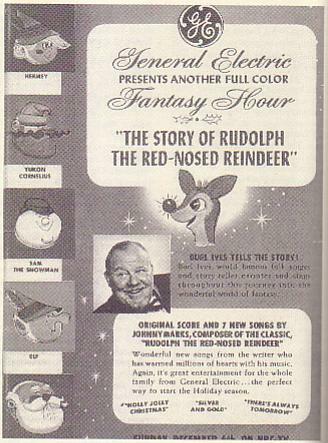 This past Tuesday, CBS ran RUDOLPH THE RED NOSED REINDEER for the umpteenth TV Holiday season. 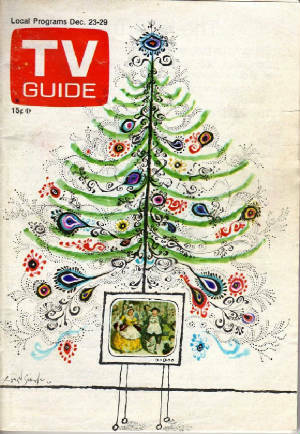 Originally shown on NBC in 1964, this sleigh guide has been a perennial every year since then. This year, despite it’s age, RUDOLPH was the second highest rated show on any network Tuesday night. Simply amazing for something that has been seen so many times, but it has become so important to the season that you sit and watch it every Christmas season. I did, and I already have it on DVD! The question though, is “did you see all of it?”. Over the years, many shows are altered from their original broadcast form due to time constraints, increased commercial time or updating the credits if the original show was sponsored by a single company. This may also happen if there are inferior source copies that won’t allow a quality showing. At rare times, it may be because of copyright on a song or an objection to material. RUDOLPH is a great example of this. In 1965, in response to viewer demand, a scene was added at the end. In the original show, Santa makes a promise to the Island Of Misfit Toys that he will come back for them, but he simply heads off to deliver his workshop toys on Christmas Eve. Viewers felt that showed that Santa had broken a promise, and they added the scene where he goes back and takes the Misfit Toys with him. Other cuts and changes are chronicled on the Rudolph The Red Nosed Reindeer Wiki page. Just click the link. A CHARLIE BROWN CHRISTMAS has also suffered the same fate. When released in 1965, it was sponsored by Coca-Cola and had actual product placement in the print. Over the years, those were removed. Trims were made for additional commercials or to fit a time slot. Even the version that runs on ABC TV has some trims to allow it to buddy up to a second holiday cartoon in a one hour time slot. Footage of the Coca-cola opening and placements, as well as any other cuts, are very hard to find. A similar fate befell MISTER MAGOO’S CHRISTMAS CAROL over the years. Because of it’s original 53 minute running time, subsequent showings required trimming scenes. Because the show used the conceit that Magoo was actually going to star on Broadway as Scrooge, there was an opening number that shows Magoo in his standard guise of driving to the theater and causing havoc because of his bad eyesight. This framing device was usually cut. Many other Christmas specials suffered the same fate. Most DVD release include all or most of the original cuts, but not always. 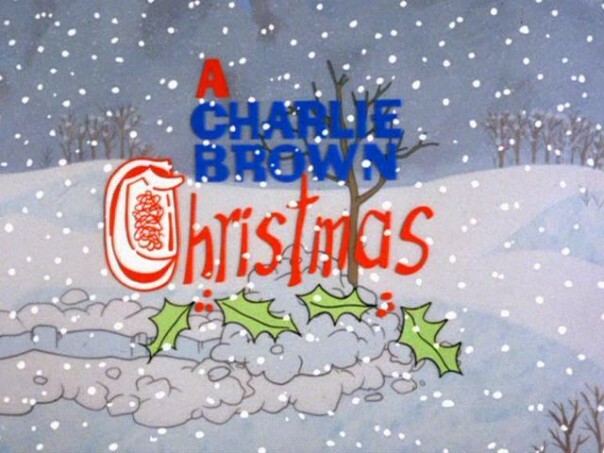 So, hold on to your childhood memories of TV Christmases past, because they may be the most complete versions of these.